Okinawa, Japan is known as one of the world’s five Blue Zones — regions in which people are known to live longer lives into their late 90s and 100s as a result of being physically and mentally healthy. The people of Okinawa generally tend to get plenty of exercise, eat a healthy diet, spend lots of time outdoors, and practice a certain positive mindedness that allows them to live happy, fulfilling lives. How do the people in this region get to live so much longer than Americans? Here are six secrets to living longer according to the long-lived people of Okinawa, Japan. Okinawans spend lots of time outdoors in the sun doing physical activities that include gardening. When you spend time in the sun, your body produces vitamin D, which promotes strong bones and overall good health. As a result, those who spend time in the sun benefit from having optimal vitamin D levels all year round. Most Okinawan people practice gardening, which has been found to help reduce stress and encourage daily physical activity. Plus, gardens are the source of fresh herbs and healthy produce. Okinawans are known to grow turmeric, mugwort, and ginger — all of which have been proven to have medicinal qualities that can fend off illness and disease. Older Okinawan people generally eat healthy, nutritious plant-based diets that consist of tofu, stir-fried vegetables, and sweet potatoes. During special celebrations and ceremonies, Okinawans sometimes consume pork in small amounts, but eat vegetables at all other times. In addition to tending to their gardens on a daily basis, Okinawans take frequent walks outdoors. The typical Okinawan household has little to no furniture, which encourages residents to spend less time indoors and more time outside. Meals are normally taken while sitting on tatami mats on the floor, which requires people to get up and down off the floor several times per day and helps build lower body strength. In Okinawa, a life purpose is known as an “ikigai,” otherwise known as a reason to wake up in the morning and live a fulfilling life. Research has shown that those who have an ikigai tend to live longer lives since they feel more responsible and needed. 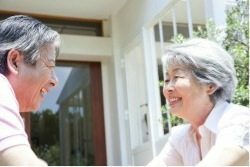 Okinawans focus on maintaining a strong social network or gathering of people, also known as a “moai.” Having a supportive group of friends and family means having people who are there to love and support you during times of emotional and financial need. Rock Creek Wellness is a medically supervised wellness center in Kansas City that includes modalities for both your inner wellness and outer beauty. We invite you to contact us today to schedule an appointment to begin your journey to look and feel your best! Feel better, look better, live better.Schedule your free consultation today.